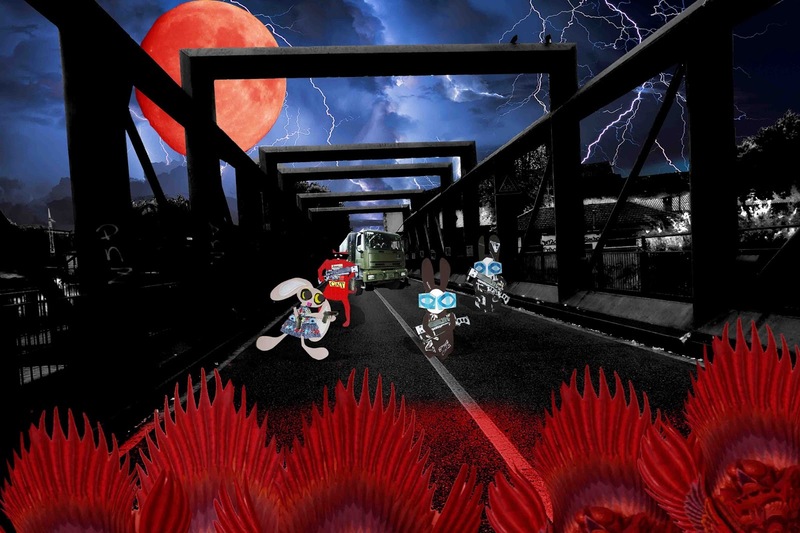 The Wabbit knew they had to meet the creatures and he had a feeling it might be on the bridge. Quantum the Train was on the other side and could come no further. Anyway, a confrontation was inevitable. It was only a matter of where and when. Wabsworth blocked the bridge with the truck and and the team got out. Lapinette waved two automatics. "Who goes there?" she shouted. "State your business," yelled the Wabbit. "Speak or we fire!" shouted Wabsworth and he pointed his snazer. The creatures did not speak, but blood oozed along the asphalt and towards the team. The smell was overpowering and the sound was worse. It swirled and bubbled and made a slithering oily sound like molten molasses. The Wabbit was uncertain but he didn't show it. He raised his snazer gun and pointed at the leader. "Aim for their brains!" shouted Wabsworth. "Do they have brains?" sneered Lapinette. "Kill the brain and you kill the ghoul," hissed Skratch the Cat. The blood stopped dead and lapped backwards like a wave. 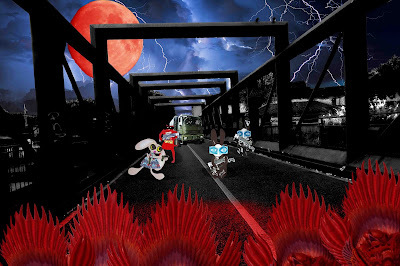 The Wabbit hopped forward, put a foot in the blood and drew a crimson line along the bridge. "Talk," he said calmly "Talk or we'll finish you." An angry roar echoed from the iron struts. "Give us your blood!" The Wabbit turned his back on the creatures and winked at his team. "How much do we have in the truck?" "Litres and litres, Best royal blood from Kensington." smirked Lapinette. "Blue blood," laughed Skratch. A murmur of excitement came from the creatures. The Wabbit turned back and spoke sharply "What do we get in return?" "You may pass freely," said the leader. "Then queue along the line," smiled the Wabbit, "and prepare for a treat ..."